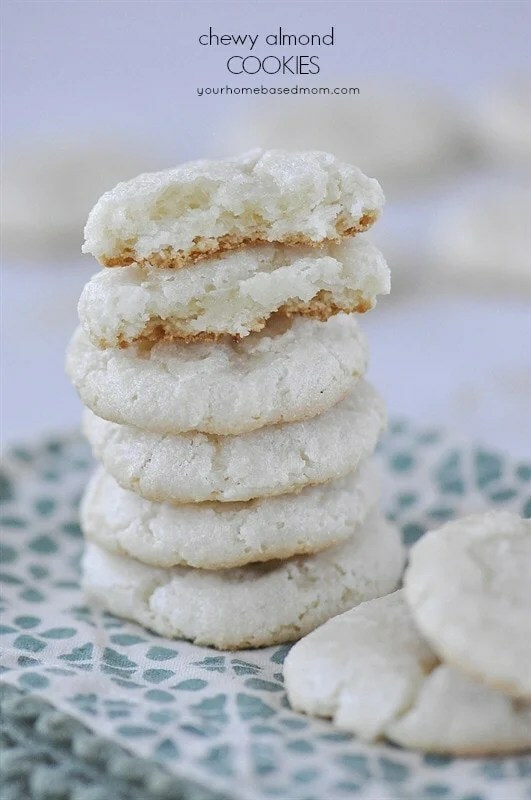 These chewy almond cookies only have 3 ingredients but are full of wonderful flavor with a crispy exterior and chewy interior. I am excited to be here today on Jen’s blog. Her blog is my go to place for creative and inspiring ideas. I’m Leigh Anne and you can find me and everything pretty and delicious over at Your Homebased Mom. 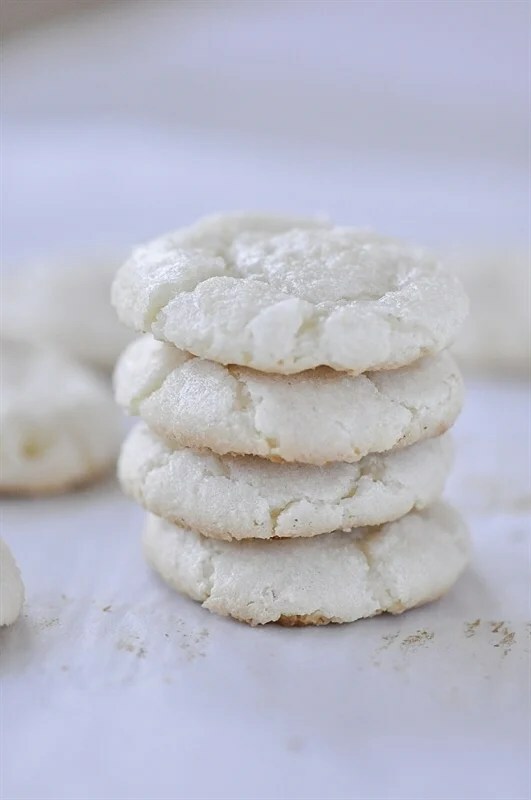 I’m excited to share a yummy, simple recipe with you today that deserves a place of honor on any cookie plates you may be putting together this holiday season. Your friends and neighbors will love you and they won’t be able to stop talking about these lovely little pillows of almond goodness. I love almond flavoring and especially love it in my cookies. My very favorite sugar cookie of all times has almond extract in it. Another one of my favorite almond is recipes is this Almond Torte. I can’t ever quite get enough of it. 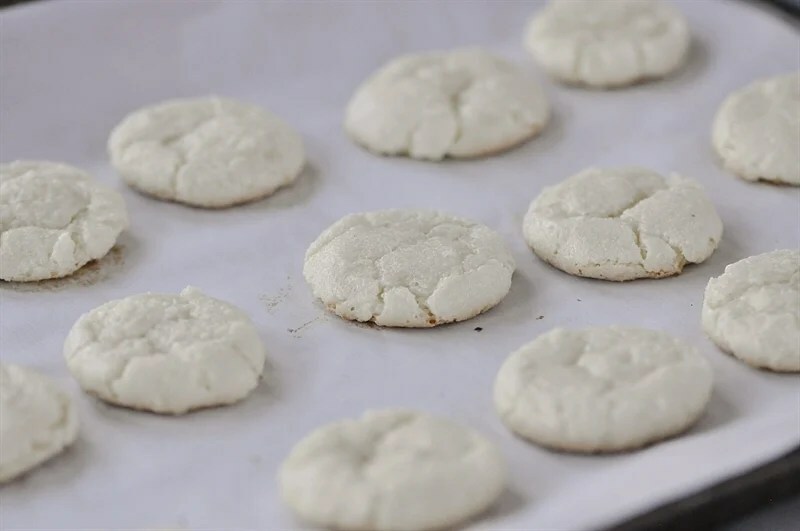 Today’s recipe for chewy almond cookies is about as easy as a cookie recipe can get – only three ingredients. 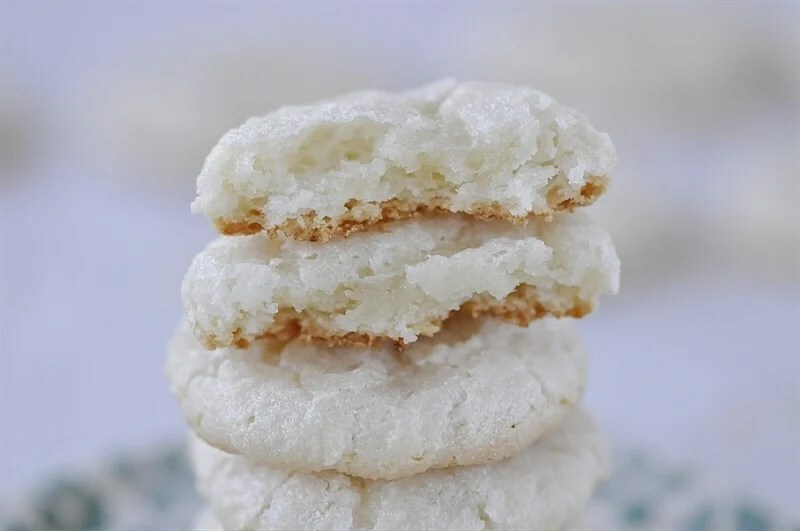 The recipe uses almond paste which can be found in the baking aisle of your grocery store, sugar and eggs. That’s yet. 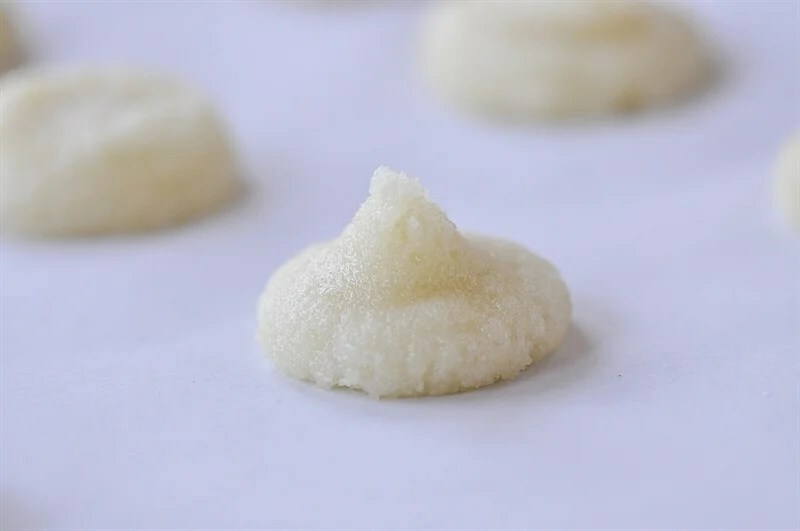 Place the almond paste and sugar in your food processor and process until it is all broken up and then add in your eggs and pulse until it comes together and is smooth. You will need a pastry bag and a large round tip, about 3/4 inch in diameter. 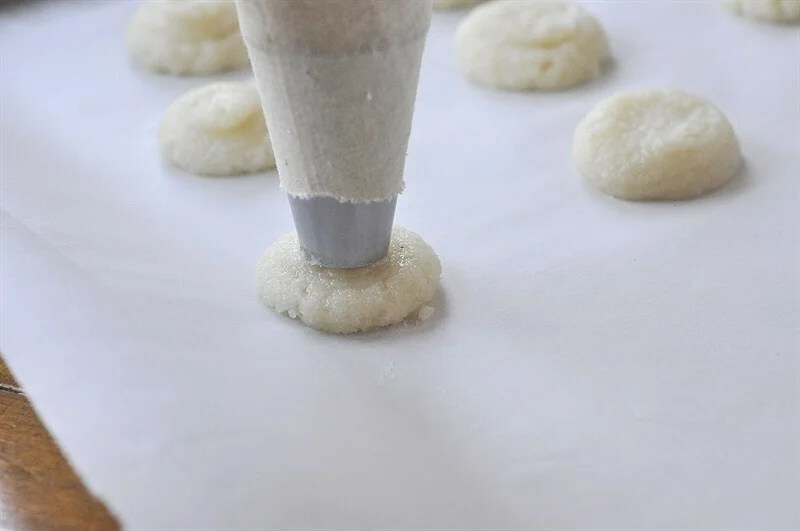 Fill your bag with your mixture and then pipe out about 1 inch rounds onto a parchment lined cookie sheet. 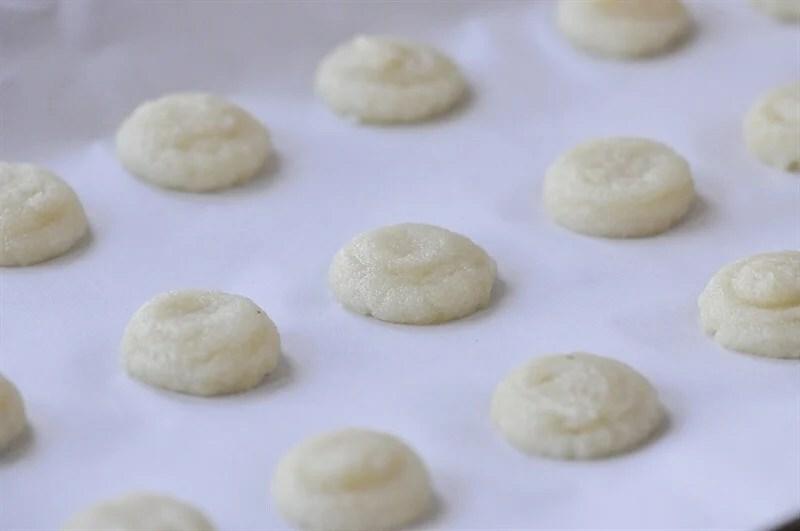 You will end up with little points on your cookies, just dab your finger into some water and smooth off the top of the cookie. Bake at 300 for about 15 minutes, rotate pan around halfway through the baking process. Bake just until the edges begin to turn golden brown. Let them cool and remove from the parchment paper. The only thing left to do is take a bite and enjoy the soft , chewy almond goodness. 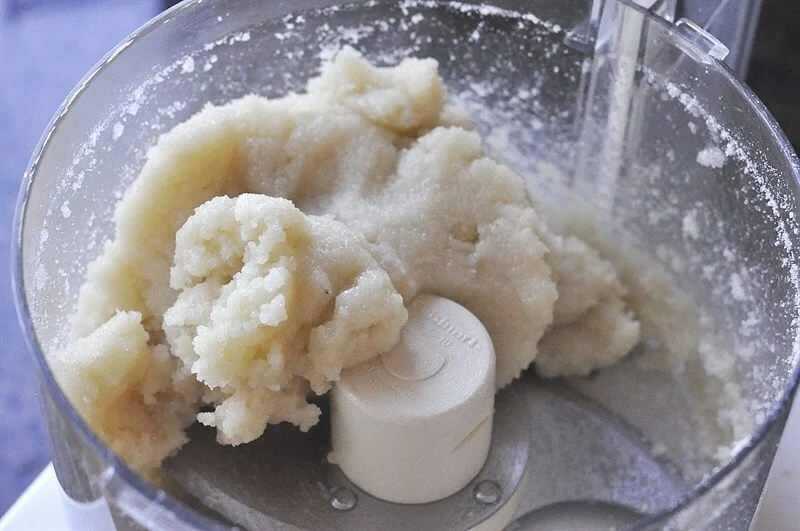 Pulse almond paste and sugar together in food processor until broken up. Add in egg whites and pulse until smooth and mixture has come together. Put mixture into pastry bag with the tip in it. Bake for 15 minutes or until cookie is golden brown around the edges. Rotate baking sheet half way through baking. Her Peppermint Eggnog Punch looks like a great party drink to serve up over the holidays! And these Mint Dipped Double Chocolate Cookies look like another holiday favorite to try! And you’ve got to try her 30 Minute Rolls! Yum! Easy Orange “Milano” Dipped Cookies! Tang Tea Neighbor Gift Idea & Holiday Printable! My mixture came out runny, and cookies were flat, though I used exact measures and made sure the yolks didn’t break into the whites. How could I adjust the thickness of the mixture? Should I have added more almond paste to thicken it? Less egg white next time? I’m so sorry Taryn! It was a guest post and not my recipe. Thanks for letting us know. What exactly happened? We don`t have Almond Paste here… Can I use Marzipan with a small amount of sugar in it? Have your tried freezing them? These are yummy!! They are super chewy & we loved the almond!! Do you know how many cups of almond paste is in a 7 oz. tube? I buy in bulk and I don’t think it converts to 8 oz. Mine turned out a different texture than yours pictured! These cookies look so delicious! My grandma makes some really similar to this, and I love them!